Celebrating the work of backyard builders and up and coming workshops represents a large part of what Tank Moto is all about to me. The nineties was all big budgets and bling with shows like American Choppers vomiting up bikes that were supposed to showcase what custom building was all about. Nowadays bikes of that category still exist, but they’ve become a minority. They have their place, but it’s not in the pages of this publication. Instead I’d prefer to show what can be done with small budgets, skilled hands, a keen design eye and good old fashioned moto-passion. When I contacted Katros Garage’s workshop owner Andi Akbar his response was as humble as they come. “We're glad you’re coming to Indonesia and that you want to visit our workshop. But, please don’t expect Katros to be a large, nice looking garage. We started as a hobby, not a big business and we work to realise our ideas in a small space.” Straight away I knew visiting Katros was a must. I had been introduced to Andi’s work by Tommy from Gearhead Monkey Garage and had seen a very interesting bike pop up on their Instagram feed. It was called the Mammoth Liar and as you can see in these shots, it’s not your average build. So we locked in a day with Andi to see the bike while we were in Jakarta and made our way there early one morning. We arrived at Katros before Andi, and his statement about the workshops size was certainly true. After walking up and down the street we finally spotted a tiny Katros sign right next to our car out the front of a building no more than three meters wide. It had a single roller door on the front wide enough to fit motorcycles through or perhaps a mini with its mirrors folded in. After a short wait one of Andi’s work mates arrived and open up the roller revealing the contents of their small workshop. As he rolled bikes out of the shop we were able to squeeze in and take a look. Along with a few mild custom builds there were one or two more extreme creations underway. I spotted two XS650s one in a frame with half finished, hand beaten bodywork and the other sitting on a shelf waiting its turn. From what we saw it looked like Andi and two other workers tinkered away in the workshop, elbow to elbow, and I felt privileged to have my own shed at home that was about half the size of their entire workspace. Unfortunately the Mammoth Liar was nowhere to be seen. When Andi arrived he explained to us that the owner didn’t have papers for the bike yet so riding it to the workshop was a concern. Although most altercations with the police in Jakarta can be settled with a quick exchange of funds, he didn’t want to take the chance. Luckily the owner lived very close to our second stop for the day, Studio Motor, so we agreed to meet Andi there. Andi arrived at Studio Motor later that day as promised and we set up for the shoot. His Mammoth Liar is based on a Yamaha Scorpio 225cc. It’s Andi’s first personal project and one he is very proud of. He was quick to point out his work wasn’t perfect, but made sure we knew that a large part of the bike was handmade. The aluminium bodywork represents Andi’s second experience with working with alloy in this way. He does all the welding, cutting, shaping and finishing himself and this bike took twelve months of part time work to complete. The design of the Mammoth Liar was based on a sketch by his customer. It was drawn with the stance and proportions of a prehistoric Mammoth hence its name Wild Mammoth or Mammoth Liar (pronounced Leear) in Indonesian. Of the original bike only the Scorpio frame and engine remain. The frame has been shortened in the rear to reduce the seat to a solo and the twin tube swingarm was handmade by Andi to extend the rear wheel back by 5cm. To lower the bike’s stance Andi also customised the mono-shock suspension mounts and machined a 41mm Yamaha Bison front end to fit the Scorpio frame. The wheels are a combination of TK Japan rims and Yamaha SR hubs laced with gold spokes. Its handlebars are custom made clip-ons and the footpegs are from a Honda Cub, mounted using custom adapters. Beneath the seat is an alloy box which houses the bikes electrical components and the seat itself was finished by a streetside leather worker. To allow the removal of the airbox and the adaption of a velocity stack the Scorpio’s carburettor was replaced with a vacuum style Kehin carb and a one off exhaust system with underbelly muffler was added. All of the aluminium on the bike was fabricated by Andi in his modest workshop. Starting with paper templates he cut 3mm aluminium sheet, which he then shaped by hand and welded together. 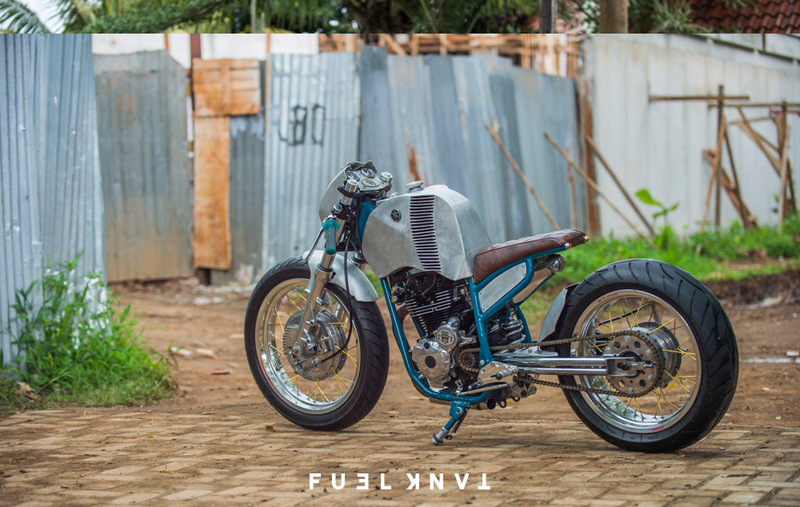 The bikes fenders, headlight surround and its unusual looking, hunched fuel tank took countless hours of work to complete and Andi stated he learnt a lot about working with alloy during this build. To finish its appearance the bodywork was then given a brushed finish and the frame painted with a striking blue/green paint mix. Andi told us he has been building bikes since 2009 under the name of Katros Garage. He studied advertising at university and was a contributing journalist to a popular Indonesian automotive magazine for a few years. However he grew up as the son of a mechanic and he developed a passion for motorcycles at an early age. When the opportunity presented itself Katros was born and Andi now wants to relocate Katros to a larger premises with the dream of building bikes where he gets creative freedom. With the Mammoth Liar and his upcoming XS650 build to showcase his creativity and his ability I don’t think he’ll be waiting too long from that dream to become a reality.